Each year, millions of pets become ill during the holidays, with intestinal obstructions, chocolate or other toxicities, and pancreatitis, being some of the most common reasons. In order to ensure that your Thanksgiving holidays are filled with happiness rather than long waits in a veterinary emergency room, follow these simple precautions to help keep your pets safe. Besides leading to obesity, eating fatty holiday foods can also cause a life-threatening inflammation of the pancreas gland called pancreatitis. In pets, pancreatitis is usually caused by ingestion of fatty foods like turkey, ham, gravy, and chicken skins. If left untreated, it can be fatal. Bones also pose a serious danger to pets. Poultry bones are dangerous because they can splinter and get lodged in the gastrointestinal tract and therefore should never be given to pets. Ham and beef bones can break teeth or can also cause intestinal obstructions. If you wish to give your pet a special holiday treat, instead of giving them bones, consider giving them a healthy dental treat specially intended for safe chewing and dental hygiene. Chocolate: Most people know that chocolate is toxic to dogs and cats. Depending on the amount consumed, it causes vomiting, diarrhea, rapid breathing, increased heart rate, seizures, and even death. Never give your pets chocolate and of course keep this sweet treat out of reach of your pets. Xylitol Flavored Sweet Treats: Candies, desserts and other foods that contain the artificial sweetener xylitol are very dangerous to pets. Xylitol causes insulin release leading to low blood sugar levels and can also cause liver failure. Be sure to keep all these sweet treats out of reach of hungry pets. If your pet manages to steal some candy or dessert containing xylitol, immediately call your veterinarian for help or take your pet to a veterinary emergency clinic. 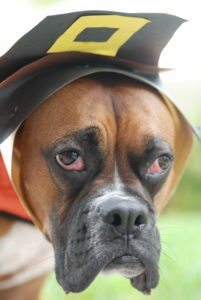 Raisins and grapes: Many Thanksgiving dishes contain raisins or grapes which can be very dangerous for pets. Grapes and raisins have been reported to cause severe kidney damage. Nuts: Many nut varieties are toxic to pets and can have a devastating effect on dogs’ nervous systems. Walnuts and macadamias are especially toxic and can cause vomiting, paralysis and even death. Onions: Onions, chives, and garlic in any form are poisonous to pets. They cause lethargy, weakness, ataxia (lack of coordination), hyper-salivation, anemia, and even death. With so many tasty dangers often at pet’s eye level, it is always best to keep pets out of the kitchen and away from the celebration. And while sharing is in keeping with the holiday spirit of goodwill, sharing leftovers with our pets can lead to serious health problems. Instead of giving your pet leftovers from your holiday meal, give your pet a pet-safe treat or a new toy. You can even give them a Turkey Cranberry flavored treat in the spirit of the holidays. 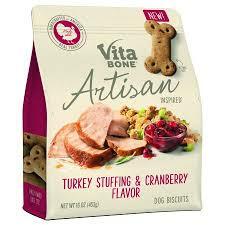 My dog loves these Vita Bone Artisan Inspired Turkey Stuffing & Cranberry Flavored Treats. Although the holidays are usually joyous times, as anyone who has ever hosted a holiday party knows, they can also be stressful times. This can be especially true for our pets. The revolving door of visiting guests and the break from the routine can frighten our pets and cause them to run away. If your pet tends to easily get scared, nervous, or becomes protective, it is important to keep them confined safely inside your house. Many pets are lost during the holidays when they jump out of their yard or dart out of an open door. Remember all pets, even strictly indoor cats, should have collars with tags and microchips so that if they become lost they can be returned safely home. Keep these important tips in mind during the holidays in order to keep your pets safe.